Few months back I wrote an article titled URL Rewriting in ASP.NET that illustrates how URL rewriting can be accomplished via code. ASP.NET 2.0 doesn't change the situation too much but has added some handy configuration options for URL mapping. In URL mapping a URL1 is mapped with URL2 so that when user requests URL1 actually it is the URL2 that is served. When URL mapping is useful? As you can see the enabled attribute of <urlMappings> section enables or disables the URL mapping feature. The <add> sub section allows you to specify the actual mapping. The url attribute of <add> section specifies the URL as seen by the end user. It can be from browser address bar, hyper link or Response.Redirect statements. 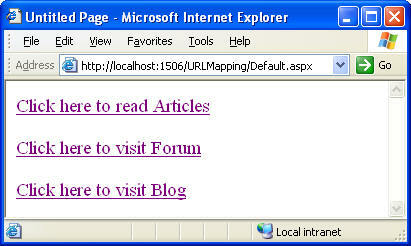 The mappedUrl attribute species the URL that is actually served in place of the URL specified by url attribute. This in above example if user requests articles.aspx from the browser address bar then default.aspx page from articles folder is served. You can specify as many URL mappings as you wish using multiple <add> tags. As you can see there are three HyperLink controls. The NavigateUrl property of the HyperLink controls is set to articles.aspx, forum.aspx and blog.aspx respectively. The Text property of each hyper link is set as shown in above figure. Then add three sub folder to your web site - Articles, Blog and Forum. Add a new web form named Default.aspx in each of the folder. Drag and drop a Label control on each default.aspx and set its Text property to "This is Articles Folder", "This is Blog folder" and "This is Forum folder" respectively. Add web.config file (if it is not present already) and key in the <urlMapping> section shown above inside the <system.web> section. Now you are ready to run the application. 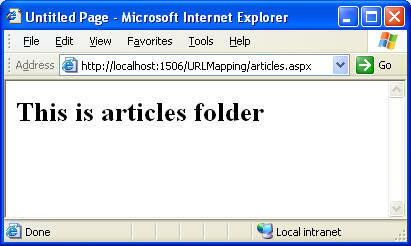 Set Default.aspx from the root folder as the start up page of the web site and run. Click on "Click here to read Articles" hyper link. You will notice that though the browser address bar and hyper link shows the URL as articles.aspx the content rendered is from ~/articles/default.aspx. The following figure shows this fact.